Welcome to the Alabama Bluebird Trail (ABBT) website. We are the official site for the trail that currently runs along Highway 14 through Autauga County and Elmore County. We are most excited that you are visiting with us. As you look through the site you will learn about our history, hopefully discover some interesting facts about bluebirds that you didn’t already know and spend some time with our interactive map. Sorry, but this map is not up to date. So enjoy yourself! 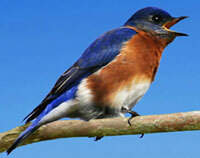 The Autauga Bluebird Trail saw growth and change during the 2009 breeding season. A number of boxes were added to the trail: 20 boxes were added at the Prattville Country Club; 25 boxes were added at various locations in Elmore County; 5 at Jackson Island; and 14 at Lanark, headquarters of the Alabama Wildlife Federation. This brings the trail total to 232 boxes in Autauga and Elmore counties. There are 33 sections of boxes comprised of several to approximately 20 boxes in each section. There is a monitor for each section that checks each box weekly during the breeding season. Two hundred of the 232 boxes on the trail housed birds during the breeding season this year. This means 86% box usage, high for any trail, by some species during the monitoring period from March 30-July 19. In all, 410 nests were built in trail boxes. Of those built, 314 were Bluebird nests, and the remainder were occupied by House Sparrow, Carolina Chickadee, Tufted Titmouse, Carolina Wren, and Brown-headed Nuthatch. These birds laid 1,377 eggs, and fledged 989 birds (821 Bluebirds). The Trail encountered several issues during the year. There were two instances of a rat snake finding a way into a box and destroying the eggs or nestlings. All of the boxes have predator guards, but in these cases, the snakes outsmarted the guard. One snake came in from a branch overhanging the box, and the other was small enough to get by the predator guard. Ants also proved to be an issue in some areas. During an extremely wet June, ants left the soggy ground looking for a dry place to nest. Some of these invaded our nest boxes, forcing the adult birds to abandon nesting. Tommy Pratt contacted Cornell University for information on how to handle this situation. He was instructed to spray the boxes and ground with a solution of Borax and to also grease the pole with STP motor treatment to deter the ants. This proved to be an adequate solution to the problem. 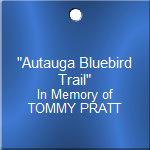 We are pleased to continue the Autauga County Bluebird trail in the memory of our founder, Tommy Pratt. The season is off to a good start with 216 boxes. There is much work to be done on repairs, clearing overgrown tree limbs and building new boxes. Our plans this winter is to replace all the boxes that are too old to be useful. We hope this will be an exciting season. Watch this space for updated information yet to come on this wonderful project! The Autauga Bluebird Trail welcomes your suggestions and recommendations. Please feel free to email Anita with your comments.